Around the world, nature reserves and national parks form large segments of the tourist industry. In Siberia, which has enormous untouched forests, rivers, lakes and mountains, this trend is still emerging. Herein lies its main advantage: ecological routes feature enormous variety and the wilderness is not overflowing with tourists. RBTH has selected a list of parks where lovers of wild nature, science and quiet will feel most at home. This reserve is a truly harsh, wild and beautiful Siberian destination. It is located in the Krasnoyarsk Territory (3352 kilometers from Moscow) in the Turuhansky and Evenkyisky districts. This is the very heart of Eurasia with the Yenisei River, the rugged Stony Turgunsk, a sea of unspoiled taiga, bears, moose, wolverines, lynx and the sable – a historically important Siberian animal now under special protection in the reserve – all making appearances. Four hundred million years ago, when only the seas and oceans were inhabited, this area was a warm tropical sea. The sea did not last for a long time, but in the reserve, along the banks of its turbulent rivers, it is possible to find reminders, such as corals, of this time. These fossils prove, several scientists suggest, that the territory of Siberia was a separate ancient continent called Angarida. Angarida (named for the nearby Angara river) occupied the territory of what is now the Krasnoyarsk Territory and part of the Irkutsk Region. During the time of the dinosaurs the continent became part of Eurasia. Animals are not the only ones under protection at the Central Siberian Reserve, as the Ket people, indigenous to Siberia, are too. A reserve called Eloguysky was set aside for their inhabitation. The Kets (according to some researchers they are the ancestors of North American Indians) live according to tradition on the banks of the Yenisei, engaging in fishing and hunting. Old Believers also live within the borders of the reserve. There are several paths in the reserve with one of the most interesting being the unclimbed route of Fridtjof Nansen, the famous 20th-century Norwegian traveler and polar explorer. His route, which you can read about on the website via Google Translate, involves travel by motor boat, hiking and sleeping in tents. To see a truly untouched Siberia. This reserve is located in the Irkutsk Region at Lake Baikal (5110 kilometers from Moscow). The Baikal reserve includes the Kabansky and Altacheisky reserves in the neighboring Buryat Republic. Here the conservation of southern Baikal is underway. This area of the lake is home to 360 types of animals and birds. Among them are many rare species, such as the bustard, the golden eagle, the white-tailed eagle, reindeer and an unusual type of salmon. Since this reserve occupies a small area, its territory is easily accessible and human settlements are located close by. Here Baikal is truly protected: there are no trains clanking along its shores and the tourists that do come here are truly interested in the nature and environment. The most interesting eco-route for bird lovers is one called, Bird Paradise. It is possible to walk it, but it can also be enjoyed by boat, which can take visitors to the sandy screes and islands of Baikal where the grey heron nests. Special programs for wildlife photographers are available here. There are certainly several things one must do here: walk the Great Baikal Trail, visit the museum of nature, learn to recognize the voices of animals and birds and gaze out at the starry skies (here in clear weather it is possible to see the Milky Way). There are several international volunteer projects located nearby where one can make friends from all over the world (for more information check www.greatbaikaltrail.org). And certainly the most important thing to see is Baikal in all of its varying moods: on a clear and calm day it is serene, while during a storm the lake becomes a deep blue, an austere and seemingly impenetrable body of water. To see Baikal – the deepest lake in the world and the jewel of Siberian nature – as it is meant to be experienced. French traveler Silven Tyson’s book, “In the Forests of Siberia,” in which the author describes his experiences living on the Baikal taiga. On October 23, 2014 zoologists from around the world celebrated the International Day of the Snow Leopard – a rare predator, whose numbers have declined significantly. According to experts, there are only about 3500 - 7500 left. At the Sayano-Shushensky Reserve in south Krasnoyarsk Territory (3955 kilometers from Moscow) the snow leopard, or “irbis,” as it is also called, is the main protected species. 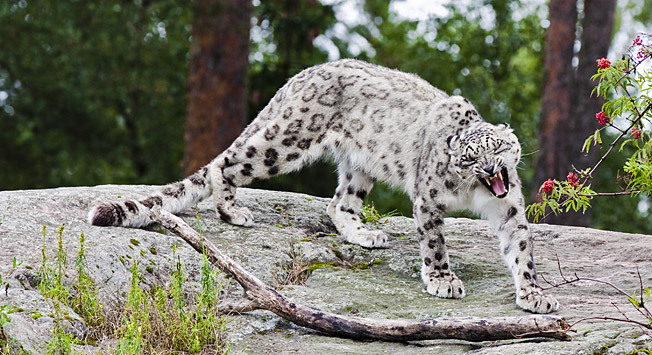 There are just six snow leopards living here, so seeing one of these animals among the dense taiga or on the mountains of Western Sayano will take incredible luck. But to meet a Siberian ibex or Siberian goat in this reserved area is possible. The reserve is also home to a wild cat called manul, wild boar, lynx and wolves. Of course, there are also bears, which the rangers and guides have had many encounters with; they love sharing dramatic and comical tales of their meetings with them. Special tours for those interested in photographing the wildlife can be organized (for more information please contact zapoved7@yandex.ru). When the Sayano-Shushensky dam was built in 1976, the decision was made to organize a reserve around it in order to see how the rise of the water level would affect the surrounding ecosystem. In order to prevent the destruction of nature, the reserve has tried to limit mass tourism, but there are regular trips for small, organized groups. The best route of the reserve goes by the Sayansky Canyon. This journey can be completed in different levels of comfort: visitors can choose between sleeping in tents and hiking long distances through harsh environmental conditions or they can travel by boat with a chef and stay in a comfortable guest house (for more information please contact zapoved7@yandex.ru). On the route travelers will visit the Mansk reservoir with a trout farm, the impressive Sayano-Shushensky GEC dam, as well as relics of ancient man and varied flora and fauna. Of course, the spectacular views of the Sayan Mountains are on display throughout. To see where the beauty and strength of Siberian nature is combined with the might of human achievement in hydropower; to hear stories of the employees of the reserve about life on the taiga, the evil of poachers and the discoveries of scientific researchers. Watch the 2007 film, “Searching for the Snow Leopard,” produced by the National Geographic Channel.